Best Limit (BL) orders are similar to Market orders in that you enter them without a price. But, while Market orders aim to hit the bid or take the offer, a Best Limit order lets you join the best bid or offer. 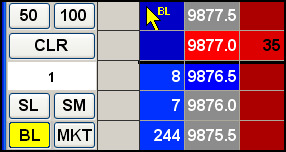 (A 10-lot buy Market order would trade at 613.45). (A 10-lot sell Market order would trade at 613.44). Set the routing and/or customer information. Select BL from the Order Types list in the Order Template section. The disables the main Price field. Configure Best Limit order parameters. Enable Best Limit in the Enable Order Types section on the MD Properties | MD Trading tab. From MD Trader, select the Best Limit order configuration. Select Best Limit configuration in the Order Type drop-down list. Click the Buy or Sell column. This displays the an order in the Working Orders column adjacent to the price..